We’d love your help. 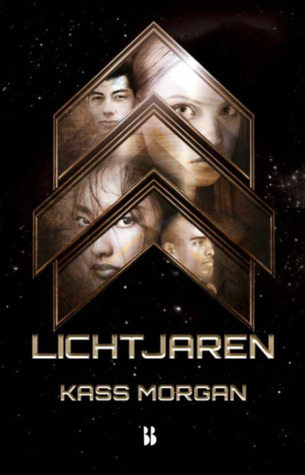 Let us know what’s wrong with this preview of Lichtjaren by Kass Morgan. Vesper is een ambitieuze piloot die alles op alles zal zetten om als kapitein geselecteerd te worden. Maar nog voor het jaar echt is begonnen, verliest ze die positie aan een briljante jongen van de verkeerde kant van het zonnestelsel. Cormak komt van de giftige planeet Deva, en grijpt elke kans aan om daar voorgoed weg te kunnen – zelfs als hij daarvoor iemands identiteit moet stelen. Arran droomde van meer dan een leven lang werken in de mijnen. Hij hoopte op een nieuwe toekomst, maar hij had nooit verwacht dat die in de armen van een jongen van andere planeet zou zijn, aan de meest prestigieuze school van het universum. Orelia verbergt een duister geheim: ze is infiltrant op de academie en heeft één missie die iedereen in gevaar zal brengen. Als iemand ontdekt wie ze echt is, is zíj degene in levensgevaar. To ask other readers questions about Lichtjaren, please sign up. Got a couple of questions about this book before I decide if to dive in. > How much does Romance play a factor? > How much does Sci-fi? > YA? > Any similarities to Pierce Brown's "Red Rising" saga and if so, how much? CerysAnne There are three, possibly four (depends on how you see it) romances that play out for the main characters, though most of them aren’t the main focus…moreThere are three, possibly four (depends on how you see it) romances that play out for the main characters, though most of them aren’t the main focus of the storyline. It’s very much a YA novel as the characters are around 17 years old and are attending a college. Ahh! I need to read this right now! Does anyone know where I can get an ARC? Light Years by Kass Morgan is the first book in the new young adult science fiction fantasy series by the same name. The series follows four different students from different planets as they join the Quatra Fleet Academy. Cormak is from the toxic planet Deva and had been struggling to survive with his older brother when he finds out his brother was killed on a mission. Right before he was killed however Cormak’s brother had been admitted into the academy so with him gone Cormak uses his ID to tak Light Years by Kass Morgan is the first book in the new young adult science fiction fantasy series by the same name. The series follows four different students from different planets as they join the Quatra Fleet Academy. Cormak is from the toxic planet Deva and had been struggling to survive with his older brother when he finds out his brother was killed on a mission. Right before he was killed however Cormak’s brother had been admitted into the academy so with him gone Cormak uses his ID to take his place. When Cormak arrives at the academy he manages to become captain of his team of four. Teamed up with Arran, an outsider from Chetire who only wanted to escape working the mines, Vesper, an ambitious Tridian citizen who had trained for years and expected to become captain and Orelia who came in with her own dark secret. The story in the book is told by switching the point of view between the four main characters as they come together at the academy. All were likable and fun to follow as we learn of their secrets and intentions and as they formed relationships around them. There was plenty of action to the story so far and an interesting cliffhanger to set up the next book. I just wondered so far if it really was that unique from other sci-fi tales just yet but with a promising beginning I’ll be sure to pick up book two. My favourite characters were Vesp 5 Words: TEAMWORK MAKES THE DREAM WORK. When I got an arc of this in an Illumicate box, I 100% looked at the cover and wasn’t all that sure about it; I’m not that fond of cover models or faces on books. However, when I picked it up, I discovered it was a really addictive book with good characters and an interesting storyline. To be sure, it’s nothing super original or overly special, but it is pretty fun and seemed to be exactly what I wanted to read. Perfect for fans of Illuminae or Across The Universe, Light Years centres around 4 narrative characters from different planets across the galaxy who all end up in an elite space academy for future members of space flight crews. The four planets that the main characters are from are interesting enough for them to take form in the imagination, though only Deva really gets any significant worldbuilding. Cormak: a boy from a toxic planet called Deva, who takes his dead older brother’s place in the Quatra Fleet Academy. Vesper: the privileged daughter of one of the Quatra Fleet’s elite commanders, who’s struggling to live up to her mother’s brilliance. Arran: a ridiculously smart boy from the icy planet of Chetire. Orelia: a girl from the planet of Loos (or so but who’s hiding a much darker secret. I actually don’t have a favourite character, as I liked all of them equally. Each of them has their own unique story, therefore making each enjoyable as none of them have content that’s crossed over and taken from the other character’s chapters. There were some really well-conceptualised secondary characters too! I thought Dash, Arran’s love interest, was really sweet; I also really liked Zafir. Also, kudos to Kass Morgan for including a plethora of diversity in really natural ways – there was a LGBTQ+ relationship, a character with a prosthetic leg, and a lot of racial diversity. This book isn’t also as long as you’d think, and doesn’t have as many central plot “beats” as a reader might expect from a 360-page book. With four characters, each with their own narrative story, not as much happens as it could, but I enjoyed this as it mean it wasn’t overwhelming, nor did I get bored. It is a book that goes by surprisingly quickly. Really, the only thing I can criticise is the mystique surrounding the villains – but then, that’s to be expected, isn’t? I expect more reveals will come about in the sequel, so I can’t really pick a fight with it. TL;DR: An easy, really enjoyable read for fans of Illuminae or any fan of space opera / the school setting. Light Years is an awesome novel. I liked the entire concept and I'm totally looking forward to reading book 2. The novel didn't disappoint. It was 5 stars from start to finish. These four rivals will have to work together to survive. Orelia is a spy on a mission but if she gets caught up in the wrong crowd she is going to lose more than her standings. And Arren is just a horney guy trying that gets caught up in thigs he never thought a simple crush would lead too. It was really cute and fast paced. I think its funny how the 100 was kids in space sent down to a ruined earth and this is kids fighting and training in a ruined space. I enjoy these types of sci fi books. Teenagers in space, each with particular skills, uniting to fight the enemy. I liked that we had four main characters and got each one's narration. The audiobook had separate narrators which made it even better. Each character was likeable in their own way and each had secrets and a past they are trying to overcome. My favorite character was Cormak, who came to the academy under false pretenses, but was smart and crafty and worked his way to the top. Aaran wa I enjoy these types of sci fi books. Teenagers in space, each with particular skills, uniting to fight the enemy. I liked that we had four main characters and got each one's narration. The audiobook had separate narrators which made it even better. Each character was likeable in their own way and each had secrets and a past they are trying to overcome. My favorite character was Cormak, who came to the academy under false pretenses, but was smart and crafty and worked his way to the top. Aaran was cute and I felt bad for what he's been through. The added LGBTQ romance between Dash and him was great. The girls were pretty badass too, although I didn't like Vesper at first. She was kind of entitled and her friends were elitist, but she improved throughout the story. ARC received in exchange for an honest review – thank you! I really struggled a lot with rating this one. On one hand, we had bland writing and minimal world-building. But on the other, we had a plotline which ended up being surprisingly gripping. The planets of Deva and Chetire are poisonous hellholes, where only the poorest – known as Settlers – live. Meanwhile, Tri is where the real cream of society live, and only Tridians have been permitted into the elite Quatra Fleet Academy – until now. T ARC received in exchange for an honest review – thank you! The planets of Deva and Chetire are poisonous hellholes, where only the poorest – known as Settlers – live. Meanwhile, Tri is where the real cream of society live, and only Tridians have been permitted into the elite Quatra Fleet Academy – until now. The first crop of non-Tridians is arriving to be trained in battle against mysterious enemies known as Spectres. Cormak has been told his whole life that he’s a good-for-nothing criminal. His older brother Rex was the only one who believed in him – but Rex is gone, having died in a mining accident just days before he was scheduled to be one of the first non-Tridian cadets accepted at the Academy. Cormak knows that if his planet Deva’s poisonous atmosphere doesn’t kill him, a run-in with the law during his water smuggling will. So he fulfils Rex’s last request and takes his place at the Academy. Arran‘s life hasn’t been much more pleasant than Cormak’s. Also not one of the aristocratic Tridians, he’s from the planet of Chetire instead. Although he’s desperately lonely, he knows too well what it’s like to face the contempt of your peers. So he can’t believe it when he ends up falling for Dash, who’s not merely a Tridian but also the son of one of the foremost anti-Settler politicians. Vesper is a Tridian, and not just any – her mother is the director of the entire Academy. Which just makes everything doubly hard for her, because she knows she has to prove herself as a gifted cadet to win her mother’s love. Admiral Haze had to pull a bunch of strings just to get her daughter into the Academy in the first place, so things aren’t off to a great start. But Vesper is determined to make her mother proud. Orelia isn’t a Tridian, but she isn’t a Settler either… she’s a Spectre, who’s infiltrated the Academy on a mission to supply information – such as the Academy’s secret coordinates – back home. But as her classmates become more human to her, she struggles with her task. One of her instructors in particular is coming to mean rather a lot to her. Light Years is told in third-person POV from these four characters. Up until around 40% in, their mental voices blurred together and it was very difficult to see them as distinct people. The fact that Morgan is light on description doesn’t help. I have no idea what most of them look like (except that Cormak is handsome because nearly every girl in the Academy wants to get with him) and this kind of blandness made it hard to visualise the story sometimes. The worldbuilding is also not great. There’s absolutely zero information on Spectres – and yes, while it’s said that’s because the Tridians themselves know nothing about Spectres, I didn’t expect the dearth of information to remain in Orelia’s POV. She’s an actual Spectre herself! So why didn’t Morgan let us learn more about them through her?We also have no idea why Orelia, out of all people, was chosen to be the spy, or how she got in, or in fact anything. I’m hoping that this will be rectified in the sequel. But even the history of Settlers and things like that were kept a lot briefer than I’d have liked. It felt like we’d go ages without any information and then suddenly get an infodump. I also felt seriously cheated when it came to Vesper’s character. For the whole book, Morgan sets her out as driven, determined and strong-willed; how quickly she forgives Cormak for his betrayal was simply not in keeping with that, and I’m very disappointed. With that said, however, I tore through this book. Yeah, I’m still not sure why either. But once the characters had resolved themselves into individual people for me, I enjoyed it a lot more. The storyline was pretty interesting; it’s essentially these four trying to navigate their first-year cadet trials, while facing their own issues. For Cormak, it’s his stress over impersonating Rex; Arran struggles with his relationship with Dax; Vesper is involved in a similar struggle with her mother, and meanwhile Orelia was sent there to kill them all. I’m told that Morgan is also the author of The 100, which is now a super-popular TV show. I’m totally clueless on that, but I can say that Light Years doesn’t suffer from the problem Mirage had of not even feeling like it was set in space. In fact, this book reminded me very strongly of Maura Milan’s Ignite the Stars. I will be reading the sequel, particularly after the way this one ended, but I hope we get a lot more information next time. This was a solid 3.5 that shot up to a 4.5 with that amazing ending! This was a complex story told in a simple and fast paced way which kept things going and was interesting. I was hoping that we would get a little more back story, a little more into their emotional plights as they struggled through all the action. In that respect it felt slightly rushed (I live for emotional turmoil lol) still it was such a good story and I can’t wait for book two. That being said, here's my review. I have to confess I only picked this book up because of the name Kass Morgan on the cover. I'm a HUGE fan of The 100, and while I like the tv show definitely more than the books, she's the woman who came up with the idea and the characters in the first place. So I couldn't wait to read another book by her (plus, space!). I didn't expect anything big from Light Years and I was positively surprised. The story is relatively fast paced and I quite enjoyed the setting and also to learn about all the different planets. The four characters the book is about come from very different planets and backgrounds and I quite enjoyed the different POVs. My favorite was probably Cormak. The storyline itself was a bit predictable though. That wasn't a bad thing, only sometimes I felt like I'd read the book already. Especially when suddenly all the characters got lucky in terms of romance I was a bit meh. Insta love for one character may be ok, but for two or three? That's unbelievable. Luckily, it wasn't all about the romance. An aspect I really enjoyed was the cultural difference and how some people always think of foreigners as less privileged or just 'lesser' humans. It really reflects our real society and shows how hard it can be for people from a different country to integrate into a new environment. I also liked the training scenes and I liked to see the characters working together and becoming a team. When it said something about all the stars becoming visible behind the windows of the space station or ship, I smiled a little (here we are again at the beginning of my review - just imagine steering a ship out into this star-scattered blackness!). 4 young adults from 4 very different worlds are chosen to enter the elite space academy. 3 of those worlds are inhabited by settlers or "edgers" and this is the first year they've been admitted to the academy. I really enjoyed this story even though it did end on a bit of a cliffhanger. The story is told from 4 POVs of the main characters, who are thrown together to form a squadron and each are extremely likeable. Because of the cliffhanger, I can't wait to see what happens next and will be readi 4 young adults from 4 very different worlds are chosen to enter the elite space academy. 3 of those worlds are inhabited by settlers or "edgers" and this is the first year they've been admitted to the academy. I never read The 100, so this was my first experience with this author's writing. I was not let down! Each of her characters (there are 4 main POVs) are well-developed and bring something special to the story. I felt fully invested in each of their lives, which is hard to do with so many main characters. This background for this story is innately political, and I like how this thread was woven throughout the story in big ways. A few elements were definitely predictable, but it didn't make it any I never read The 100, so this was my first experience with this author's writing. I was not let down! This background for this story is innately political, and I like how this thread was woven throughout the story in big ways. A few elements were definitely predictable, but it didn't make it any less enjoyable. This was a super quick book to get through but the individual story lines mixed with the overall story were damn good. I cannot wait to read what happens next! This is going to be another tough review to write as I greatly enjoyed this story. I enjoyed the setting, the characters, the plot, the twists, the turns, all of it. I am only upset about how long I have to wait to find out what happens. Short recap: The Quatra Fleet Academy is doing something it has never done before – it is opening its doors to students from outer planets of the Quatra Federation to enroll. This means they will have the chance to be a part of their military, if their squad passes all of their courses and missions. Not everyone is keen to this idea of Settlers (what people from the outer planets are referred to as) having the same opportunity so mysterious (and bad) things start to happen. Four students from different backgrounds are assigned to the same squad will come up against unimaginable tests and challenges. Will it be enough to make their bond stronger? Can things work out for the Settlers in the Academy? The way the story focused on four students was brilliantly done. They all had their own unique voice while blending together as a squad in a way that felt effortless. Cormack has had a very rough life. He came from a very poor settlement and had just suffered losing his brother, his only family. Desperate to get off of his planet that is full of toxic gas, he takes his brother’s place at the Academy. Vesper was the daughter of a very well known and respected high-ranking military officer. She is also a spoiled little rich girl that things higher of herself and lower of others. She only got into the Academy because her mother pulled strings, but it is up to Vesper to prove she belongs there. Arran was whip smart, brilliant to the point of being a genius, but very shy and reserved. His acceptance meant a better life for his mom. Orelia claimed to be from a well to do planet but that is not the truth. She was actually a spy for the Specters, a very well known enemy of Quatra Federation. The Specters want nothing more than to wipe the Federation out, and with Orelia hidden within the student population, they just might be able to do it. Do you see how beautifully complex these individual stories are?! They all have their own secrets and inner tribulations they are trying desperately to hide, all while doing everything within their power to prove they are better than the station they were born into. I do have my favorite characters but I’m not giving them away here. There were twists and turns I never saw coming, though I should have. This was a fast-paced, edge of my seat thrilling adventure. I know that phrase may get thrown around a lot but it really holds true for this story. I tore through the pages and had this story devoured in two days. One part of the story that I do hope is expanded upon in the next book is the reason for all of the ongoing wars within this universe. Nearly every planet is at war or has been attacked for some reason or another. I’d like to know more about the political thoughts behind that. That was the only underdeveloped part of the entire story but I really do believe it will be explained more in the second book. Light Years is the first book in a thrilling and romantic new sci-fi series from the bestselling author of The 100, Kass Morgan. Four cadets at the Quatra Fleet Academy will have to put their differences aside and become a team if they want to defend their world from a cunning enemy--and they might even fall in love in the process. The four main characters are Cormak, Aryan, Vesper, and Orelia. This was a fun, quick read. It is from several character’s POV and I def connected more to some than others. Each character was interesting though. I am curious to read the sequel!! I really like the set up at the end of this one. I guess my biggest issue was that some things felt a tad rushed. wHAT WILL IT TAKE TO GET MY HANDS ON THIS BOOK??? oh why is it not September yet??? An arc of this book was sent to me by Little Brown Young Readers (The NOVL) in exchange for an honest review. All thoughts and opinions are my own. To be honest with you, I probably would not have picked up Light Years if I had not been sent a copy but I was pleasantly surprised with how much I liked this book. So a huge shoutout to the folks over at The NOVL for knowing my book tastes more than I do. Super fast paced and easy to read. However, I felt it was a tad bit rushed An arc of this book was sent to me by Little Brown Young Readers (The NOVL) in exchange for an honest review. All thoughts and opinions are my own. Super fast paced and easy to read. However, I felt it was a tad bit rushed at times. This book had multiple points of view, which I may not be overly fond of, but in this book they were easily distinguishable and I found it quite refreshing to read from different perspectives. I found it super cool that this book was set in a military (high school) academy in space. Kass does a fantastic job describing everything! Well developed and unique. I loved that I got to learn about each character and their lives while reading from the points of view. The characters were so relatable and I really liked it. They had the flaws and that just made it so believable and that just clicked for me. First of all, how DARE this book end that way? What is it with science fiction novels and ending on such a big cliffhanger? I NEED TO KNOW WHAT HAPPENS NEXT! Second, wow this book was brilliant! The characters were so vibrant and the relationships were so unpredictable, I loved it so much. My only real gripe with it has to do with the plot, pacing and climax of the novel. If anything I though it all happened a bit too conveniently, particularly the big event that happens towards the end of the no First of all, how DARE this book end that way? What is it with science fiction novels and ending on such a big cliffhanger? I NEED TO KNOW WHAT HAPPENS NEXT! Cormak and his crew have to prove that they deserve their place at the Academy. But there are more plots in play than they are prepared for. I received a free copy fro Netgalley, in exchange for an honest review. I really enjoyed this book. Despite being a big fan of watching The 100, this is the first book from Kass Morgan that I've read. The story follows the four trainees that make up Squadron 20, in the Quatra Fleet Academy. These young men and women are the best of the best from Tri and the sur Cormak and his crew have to prove that they deserve their place at the Academy. But there are more plots in play than they are prepared for. These young men and women are the best of the best from Tri and the surrounding planets. Cormak - who steals his dead brother's identity to escape a dead-end life on Deva. Vesper - the daughter of the Fleet Admiral, on her last chance to prove her worth. Arran - a lad from Chetire who struggles trusting people. The narration is split equally between these four main characters. At first, Cormak was my favourite, as he deals with taking on his brother Rex's identity, and the lengths he has to go to not get caught. As the story went on, I loved everyone's part equally! They all have their issues, and their reasons for doing well. Vesper has the most unsupportive mother, who doesn't have a scrap of maternal instinct, despite the fact that Vesper is working herself to the bone to gain her acceptance. It's interesting to see Vesper with her friends and boyfriend, who are all from Tri, and consider themselves first-class citizens. As the book goes on, Vesper starts to take pride in herself, forming her own opinions and goals, and refusing to go along with belittling the other classes. Arran is just so sweet, you just want to wrap him up and protect him. He's quiet and very withdrawn, not trusting anyone easily after being traumatised when he was younger. I thought he and Dash were an adorable couple. And Orelia... she is fascinating. She has trained all her life for this role, and can't afford to be distracted. She's practically a machine, but slowly becomes more human around her new friends - a luxury she's never experienced before. The main plot is follows the challenges of the Academy, as the winning Squadron is the only one guaranteed to progress to the second year. There's a competitive spirit amongst the students, but there's also tension, as it becomes clear that there is a lot of political conflict running under the surface. After generation of being on top, not all people from Tri are going to let the dystopian, lower-class citizens get ahead. There's also the bigger threat, looming in the shadows of the Specters. An aggressive race who have been terrorising the Quatra planets. It was excellently played, with enough grey area to make you wonder what the truth really is. If I haven't mentioned already, I really really enjoyed this book, and I can't wait to start the next one - especially after that ending! I loved the concept of this book but I struggled to get invested in the execution of the characters and the story. The idea of a diverse set of space cadets from different planets and places, training to become pilots and other roles is a great concept. However, this felt overly character-driven when I needed more context about the world, the planets, the ‘space-stuff’. I really struggled to get into this book and kept setting it down but I can say that after 40% it did pick up for me significant I loved the concept of this book but I struggled to get invested in the execution of the characters and the story. The idea of a diverse set of space cadets from different planets and places, training to become pilots and other roles is a great concept. However, this felt overly character-driven when I needed more context about the world, the planets, the ‘space-stuff’. I really struggled to get into this book and kept setting it down but I can say that after 40% it did pick up for me significantly and then I was able to settle into the story. I think I might have comparion-syndrome having read some excellent YA sci-fi only recently and maybe it would have been more rosy if I hadn’t been reading in the genre. As it was quite a character-driven book, I did feel that I really got to know this cast of crew rather well and they were well-crafted. Cormack was my favourite and I was happiest when he was on the scene, I love a good underdog and that’s just what he was. I am interested to see where this goes. ARC received in the Illumicrate book box. 3.5 stars, I like the story and it became better towards the end of the book. It is a highschool story set in space. Not my usual type of book but I enjoyed it. Might read the second book, because this one does end on a cliff-hanger. I still can't stand cover models for the most part, but on the plus side, I like the diversity I am seeing on the cover. Disclaimer: I received an arc of this book from TheNovl/Little Brown Young Readers. Thanks! All opinions are my own. Synopsis: Reeling from the latest attack by a mysterious enemy, the Quatra Fleet Academy is finally admitting students from every planet in the solar system after centuries of exclu Disclaimer: I received an arc of this book from TheNovl/Little Brown Young Readers. Thanks! All opinions are my own. Synopsis: Reeling from the latest attack by a mysterious enemy, the Quatra Fleet Academy is finally admitting students from every planet in the solar system after centuries of exclusivity. Oh. My. God. That's what I have to say about this brand new series from the amazing Kass Morgan. She's an absolute powerhouse when it comes to impactful and remember-able sci-fis and she's created yet another series in which I want to be apart of (and that I can see a TV series for hint hint TV producers out there). The writing was fantastic, it just pulls you into this amazing plot and the characters are super well developed. I'd probably say this series is better than her 100 series. I also loved the LGBT+ characters and the diversity of them as well. I feel like if you liked Ender's Game, then you would love this book. The book also feels realistic. One of the first things you learn about this book is that the this is the first year other planets/cultures are allowed to enter this prestigious academy. This is very true to history and even modern time (and unfortunately, the oppression of one or many groups by one dominant group will never completely die). While it broke my heart to read about the oppression of these other planets, it added a realistic feel to the book. The only concern I had about the book was that I felt the relationship one of the characters has with her teacher feels a bit weird and can be concerning for younger readers to see considering that there are teachers out there who prey on young children. Other than that slight concern, I felt the book was completely fantastic and well paced. It'll definitely be a hit when it comes out! I really enjoyed this book. The general set-up is not new: a group of young people from different backgrounds put together in an academy, all competing to graduate with full honours. Unlikely friendships are made, there are nasty colleagues, bigotry, some danger, ethical dilemmas and romantic up and downs. Despite all this, our heroes should pull through in the end. What does set it apart, though, are the well-developed main characters with their backstories, and the moral ambiguities. The stage I really enjoyed this book. The general set-up is not new: a group of young people from different backgrounds put together in an academy, all competing to graduate with full honours. Unlikely friendships are made, there are nasty colleagues, bigotry, some danger, ethical dilemmas and romantic up and downs. Despite all this, our heroes should pull through in the end. The stage is space. The school is Quatra Fleet Academy training up new officers and pilots for the Quatra Fleet in its ongoing war against the aggressive Specters. The Quatra planets are Tri (original and ruling planet), Deva (toxic mining planet), Chetire (frozen mining planet) and Loos (tropical planet). For the first year ever, the new cadets at the Academy are being drawn from all four planets, instead of just from Tri. The story focusses on the cadets forming Squadron 20: Cormack from Deva, Arran from Chetire, Orelia from Loos and Vesper from Tri. The first three are amazed that they have been selected, and are determined to make their families (alive and dead), and planets, proud of their achievements as the first of their ilk at the Academy. Vesper, and another Tridian, Dash, are under enormous pressure from their very influential parents to conform, succeed and uphold their parents’ reputations. For the Edgers, those from Deva, Chetire and Loos, the Academy is the only chance they will have to escape the extreme poverty and poisonous, shortened lives of their home planet. They are discriminated against, and almost no Tridian believes they have the intelligence or skill set to succeed. There is only one rational response – the Edgers must be better than the best. Squadron 20 must become the top student squadron. To do this, each must put aside any prejudices or doubts, and work together as a team. Both Cormack and Orelia are hiding secrets. If Cormack’s are discovered he will be thrown out of the Academy, and into jail. The exposure of Orelia’s secret will sign her death warrant. Will their new-found friends be able to cope with the truth if Cormack and/or Orelia decode to come clean? Each of the four find romance at the Academy. The reader will have no difficulty guessing who the love interests will be. But, just because there is no surprise, does not mean that the relationships are trivial. For each couple, it involves the breaking of social taboos, that could lead to ostracism – or worse. As well as the debate on whom one should love, the story also asks whom you should hate. The cadets are being trained for war. A war in which both sides believe they were victims of vicious, unprovoked attacks. Only one character is in a position to look beyond the propaganda – and to judge each person on their own, innate merits, rather than their prescribed affiliations. When the war comes unexpectedly close, that character has a major ethical decision to make. When I finished this book, I felt somewhat bereft. These were not characters to be left in the lurch. I had become really invested in their stories and futures. I need the next book in this series, but for now will have to settle for recommending this book unreservedly. Space Battle School is my favourite Si-Fi setting and I expected to enjoy this book. I did not read "The 100", but I watched it and was looking forward to a gripping plot with many dangers and unexpected developments. I have to hand it to the author - she does good premises and interesting characters. There is an underlying threat of a mysterious enemy with unknown motives and origin. There is an imperialistic unfair society where racism is ripe and the decadent ruling class has only now began to al Space Battle School is my favourite Si-Fi setting and I expected to enjoy this book. There is an imperialistic unfair society where racism is ripe and the decadent ruling class has only now began to allow the brightest representatives of the oppressed population to apply for the prestigious elite military school, and two of those representatives are our main characters. There is a tournament within that school that will decide the future of all the cadets. There is a spy in their midst. And none of it delivers. As good as the author is at premises she falls flat on every other front. Her prose is bland and simplistic. actual growth shown on page. There is no feeling that the story is happening in space in a military facility. Besides a few made-up words and starry backgrounds behind the windows, there is absolutely nothing to separate it from another American High School soap, and not the best example of those either. Instead of a tense competition with high stakes shown in all the ups and downs we get the first and the last battle - all four pages of it. No clever twists, no imaginative solutions and close escapes, absolutely nothing exciting about it, with the predictable win totally unjustified. The kids in the book are supposed to be geniuses, but the author is clearly not one, and never met one either, it seems. There are quite a few science inaccuracies in the limited instances where any science or technology is even mentioned. But there are plenty of dresses, parties, posh foods and romances. Unfortunately, the romances are no better than other sub-plots. All three of them are abrupt, shallow and lacking that essence of first love. The only real space battle shown on page is so ridiculous it's not even worth mentioning. From that point on I lost any interest in the proceedings, especially because the last couple of chapters are clearly there to set up for the next book, not to bring any of the existing plot lines to any sort of conclusion. Des personnages hétéroclites pour un livre choral mélangeant Star Trek et Battlestar Galactica. Addictif, certains détails m’ont empêchés d’avoir un total coup de cœur, mais n’ont absolument pas gâchés ma lecture. De la science fiction pure avec des enjeux politiques et de conflits galactiques. Bref tout ce que j’aime. Ho sempre sentito parlare male dei libri di questa autrice e ammetto che avevo paura di leggere una cagata pazzesca. In realtà non è stato malaccio, anzi piuttosto piacevole nonostante gli evidenti difetti. I enjoyed this book very much, even though it was somewhat predictable. Had a good mix of different characters/ personalities. If this series continues I'll definitely read the next one. Kass Morgan studied literature at Brown and Oxford, and now resides in Brooklyn, where she lives in constant fear of her Ikea bookcase collapsing and burying her under a mound of science fiction and Victorian novels.